"TerraCycle focuses on using non-virgin materials to make only upcycled and recycled products in order to reduce the carbon footprint on our earth. Not only do our products instill an environmentally friendly mentality in consumers, but they are durable, effective and useful. Many of our products are perfect for families and kids, including a cooler made from recycled chip bags, our cooler made from Capri Sun juice pouches and our portable mini-speakers. In addition, we offer safe, all-natural and biodegradable fertilizers as well as recycled planters and gardening kits. As opposed to just offering products, we also DIY upcycling projects that kids and parents can do together, including candy wrapper barrettes, chip bag bowls, and planters made from Solo cups. KRAFT Cheese and TerraCycle, Inc. have partnered with Six Flags for a summer recycling drive at Six Flags parks across the United States. Visitors are encouraged to participate by bringing their specially marked KRAFT cheese packaging to the park entrance to receive a discount on their tickets. The packaging will be sent to TerraCycle to be recycled into eco-friendly products. Specially marked KRAFT String Cheese and Twists packages are good for $15 off general admission any day. WHEN: May 15th, 2011 through October 10th, 2011. WHERE: Six Flags locations across the U.S. in Chicago, St. Louis, San Antonio, Dallas, Los Angeles, and San Francisco." 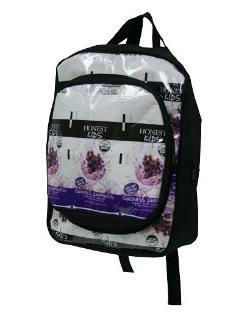 "TerraCycle makes this backpack from waste drink pouch material. Every year, billions of drink pouches end up in dumpsters and landfills across America. Working with a brigade of school volunteers, TerraCycle diverts tons of waste juice pouches annually and donates 2 cents to a charity or non-profit for each pouch collected. As an eco-friendly innovator, TerraCycle converts pre and post consumer waste material into cool new products. Help protect the environment in style with this Honest Kids Backpack!" What we thought: TerraCycle is such an awesome company! Their recycling program rocks and the resulting products are super cool. The variety of things they come up with using recycled or upcycled products is pretty impressive. The backpack we reviewed is really well-made and so cute! A starts school this year and she is so excited to be taking her "Goodness Grape" backpack along:) ABCD Diaries gives TerraCycle an A+! Buy It: Find some really cool products and get in on the recycling movement with great ideas and the collection program at TerraCycle! Disclosure: ABCD Diaries was given a backpack for review purposes only. We were in no other way compensated. The opinions expressed in this post are ours and ours alone.